Rich and velvety smooth, this broccoli cheese soup tastes better and comes together in less time than the original. Although it's plant-based, no one will guess thanks to the clever use of creamy raw cashews and umami-packed nutritional yeast. Top it off with fragrant garlic and seed oil for a crisp, flavorful topping that's a nutritious alternative to croutons. Labels like dairy-free, gluten-free, and vegan are often synonymous with flavor-free, insipid, and dull; but it doesn’t have to be that way. I’m not vegan and don’t have any dietary restrictions, so if I’m going to do plant-based, it’s gotta be something that tastes as good as (if not better than) the original. This Broccoli Cheese Soup comes together in about 15 minutes, and yet it’s just as rich, creamy, and soul-satisfyingly delicious as one made with an artery-clogging dose of dairy. While I was in there tinkering with the soup, I also ditched the croutons in favor of something that has more texture, flavor, and nutrients which has the added benefit of making this Broccoli Cheese Soup gluten-free. Until recently my go-to method of making cream of ____ soup was to cook the main ingredient in milk, and then using a starch such as bread, rice, or potatoes to thicken it. When I needed to make it plant-based, I just swapped out the dairy for a soy or nut milk. The problem is, non-dairy milks tend to be much lighter, which means you need to add a lot more milk relative to the other ingredients to make it creamy. They also don’t have the same concentration of umami-producing amino acids as dairy milk, which tends to make the soup taste bland. The solution I found is to use umami-rich vegetable stock as the liquid while using raw cashew nuts to add body to the soup. 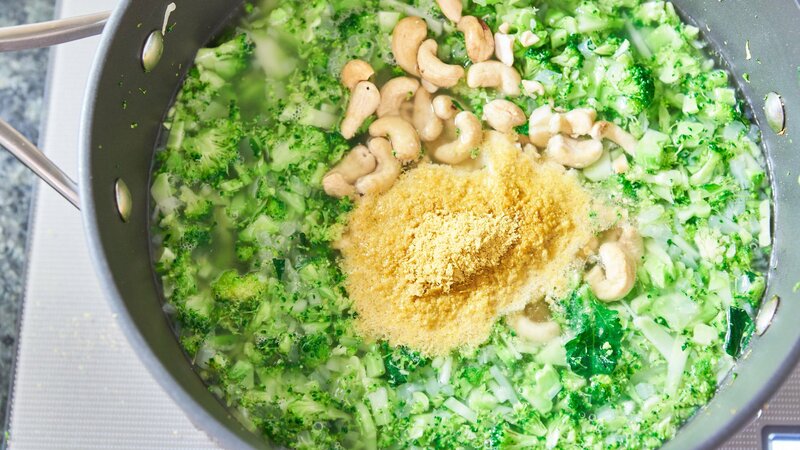 Raw cashews have a relatively neutral flavor and cooking them with the broccoli softens them up enough that they disappear into the soup once blended. The only footprint they leave behind is a rich creaminess, along with a mild sweetness that accentuates the natural sweetness of the veggies. The “cheese” flavor comes courtesy of nutritional yeast, which should really be called vegan cheese crack. The golden flakes not only provides the funky cheese flavor, but it also boosts the amino acid content of the soup making it grin inducingly good. Instead of relying on a thickener such as roux or starch, I decided to try something different this time and increased the ratio of vegetables to liquid. 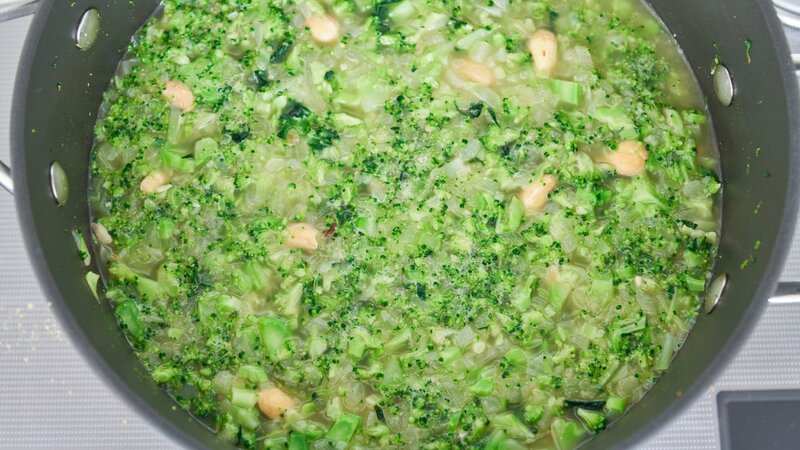 Once pureed the extra vegetables give the soup plenty of body while ensuring the soup has a robust broccoli flavor. Most recipes for broccoli soup call for cooking it until the broccoli is soft and mushy. 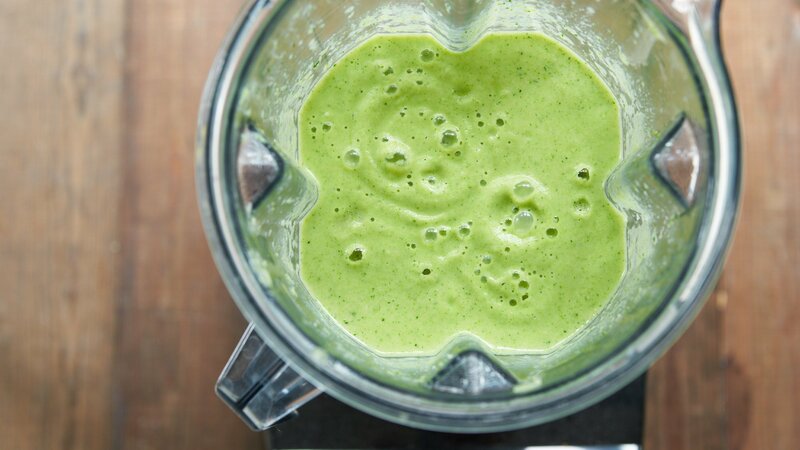 This makes it easy to puree, but it turns the soup a dingy shade of moss green while giving it a faint odor of rotten eggs. That’s because broccoli, like other members of the cabbage family, releases hydrogen sulfide when it’s overcooked. 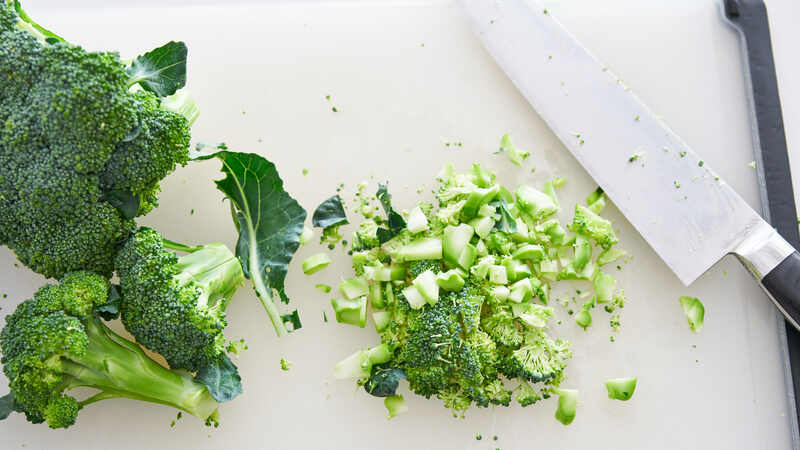 The solution is pretty simple: chop the broccoli up before you cook it. This allows it to soften much faster, preserving the vibrant color and fresh taste. Sauteing the broccoli with oil brings out its vibrant green color, and then a quick boil in vegetable stock is all it needs before it all goes into a blender. 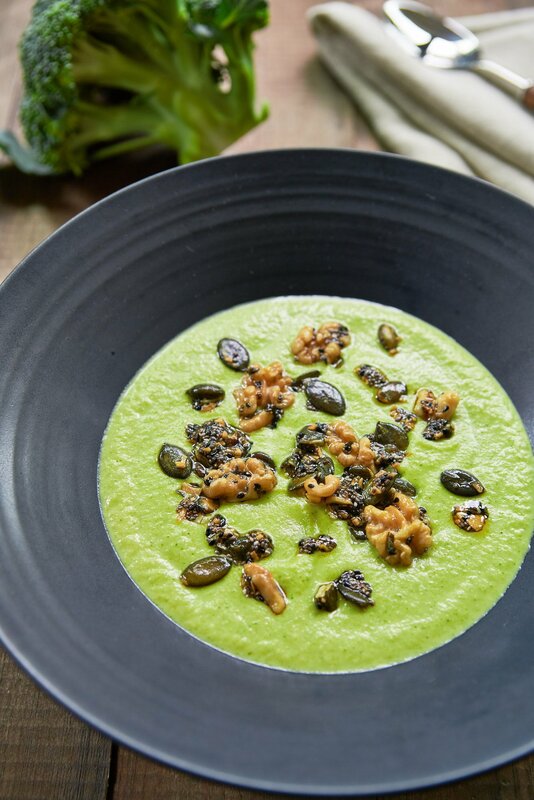 I like using a high-speed blender such as a Vitamix because it’s able to break down the broccoli into a lusciously smooth puree, ensuring the soup ends up as green as it’s going to get. While a puréed soup is fantastic comfort food while recovering from the flu, it’s a bit lacking in texture for the rest of us. Croutons are the default choice for adding texture to soup, but they get soggy in a hurry and don’t offer much else. Instead, I took inspiration from the Indian technique of tempering oil with spices. This garlic and seed oil adds a plethora of fun textures while finishing the broccoli cheese soup with a splash of flavor. The crunchy, poppy melange of textures features walnuts, pumpkin seeds, and chia seeds seasoned with bursts of caramelized garlic and Nigella seeds. If you’ve never had Nigella seeds before, they’re a unique spice with small angular black seeds that have a fabulous flavor that’s somewhere between oregano, carrots, and cumin. As a bonus, the mixture of seeds and nuts pumps up the fiber, mineral, and protein content of this delightful soup. 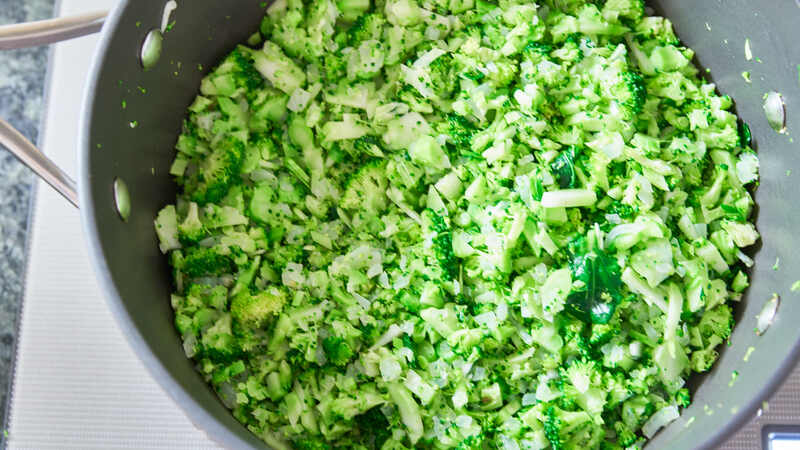 Separate the florets of broccoli and finely chop them. Trim away any stringy skin from the stalk and finely chop. Alternatively, you can separate the florets, trim and slice the stalk and pulse the broccoli in a food processor until chopped. Heat 1 tablespoon of olive oil in a pot over medium-heat and then saute the onions until they are very fragrant and just starting to turn brown. 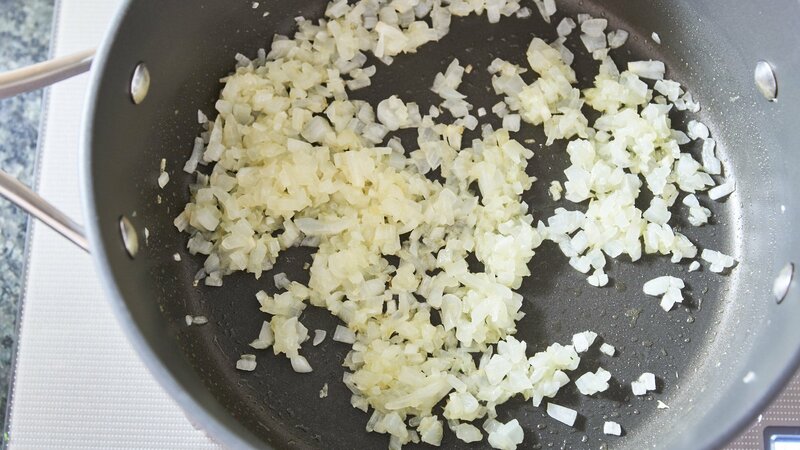 Don't caramelize them all the way or your soup will turn brown. Add the broccoli and saute until bright green, about 2 minutes. Add the vegetable stock, raw cashew nuts, nutritional yeast, and salt and bring the soup to a boil over high heat. Cook for 3 minutes. 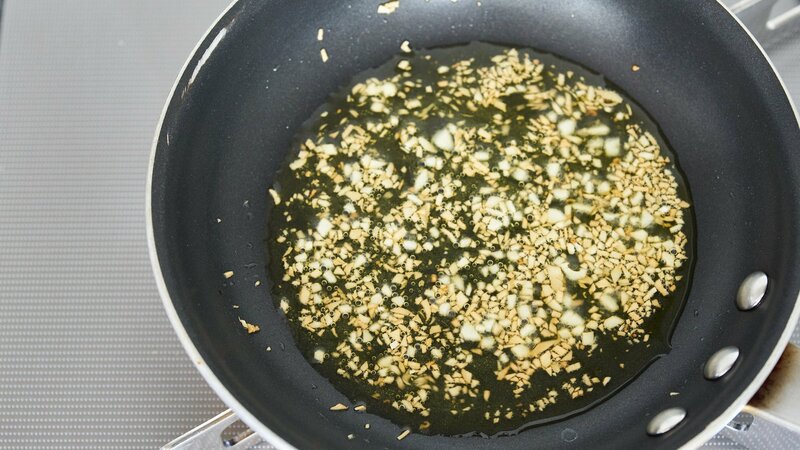 To make the garlic seed oil, add the olive oil and garlic to a small frying pan and fry until the garlic is light brown. 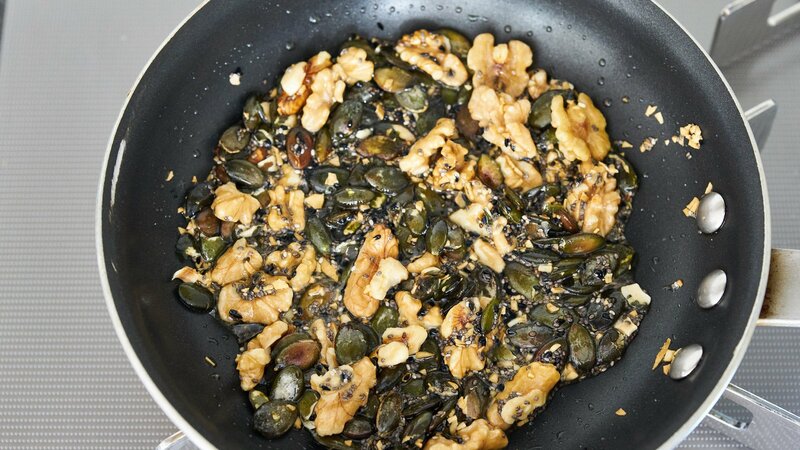 Add the walnuts, pumpkin seeds, chia seeds, and nigella seeds and season with a pinch of salt. Toast the nuts and seeds until fragrant and just starting to brown (about 1-2 minutes). Be careful not to burn the smaller seeds. 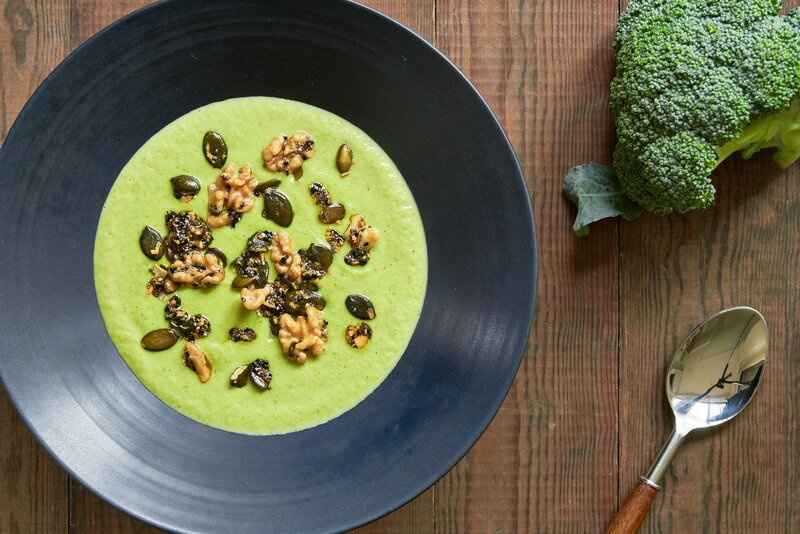 To serve the broccoli cheese soup, reheat it and ladle it into bowls. Top with a smattering of nuts, seeds, and oil.